This commemorationis a 2018 addition to A Great Cloud of Witnesses. Marie of the Incarnation, O.S.U. 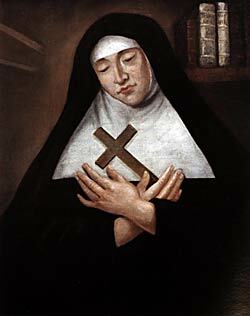 (28 October 1599 – 30 April 1672) was an Ursuline nun of the French order. As part of a group of nuns sent to New France (Quebec) to establish the Ursuline Order, Marie was crucial in the spread of Catholicism in New France. Moreover, she has been credited with founding the first girls’ school in the New World. Due to her work, the Catholic Church declared her a saint, and the Anglican Church of Canada celebrates her with a feast day. Marie of the Incarnation was born Marie Guyart in Tours, France. Her father was a silk merchant. F rom an early age she was drawn to religious liturgy and the sacraments. She married and had a son, but her husband died shortly after her son's birth. Free to pursue her religious inclinations after her husband's death, Marie took a vow of chastity, obedience and poverty. Over time, her inclination toward religious life only grew and eventually led her to enter the Ursuline convent on 25 January 1631. While there, Marie became more and more encouraged to travel to New France. So much so, she experienced a vision that would inspire her voyage to the New World. On 4 May 1639, Marie de l’Incarnation and her benefactor, Madeleine de la Peltrie, set sail from Dieppe for Quebec on board the Saint Joseph. They were accompanied by a fellow aristocratic Ursuline Marie de Sanonières, the young commoner Charlotte Barré, three nurses, and two Jesuit Fathers. In August 1639 the group landed in Quebec City and established a convent in the lower town (Basse-Ville). When they began their first work at the foot of the mountain, Quebec was but a name. Hardly six houses stood on the site chosen by Champlain thirty-one years previously. In 1642 the Ursulines moved to a permanent stone building in the upper town. The group managed to found the first school in what would become Canada, as well as the Ursuline Monastery of Quebec, which has been designated one of the National Historic Sites of Canada. Marie de l’Incarnation’s early interactions with Native populations were largely shaped by the constraints created by differing lifestyles, illnesses, and alliances. . This made it difficult for Marie and the other Ursulines to educate young girls with methods developed in Europe. The main objective of the Ursuline school was to educate young French girls and Natives to become good Christians. The girls were taught French mannerisms and were taught how to dress based on French culture. After their education, the young aboriginal students were encouraged to go back to their homes and share their teachings. By educating young girls from different tribes, francization was transmitted from daughter to mother. In her writings, Marie emphasized the fact that the Aboriginal students were treated the same way as the French students at the school. Many of the nuns created mother-like bonds with the First Nation students. In addition to her religious duties, Marie composed multiple works that reflected her experiences and observations during her time in the New World and the spiritual calling that led her there. In relation to her work with the indigenous population, Marie learned Montagnais, Algonquin, Huron, and Iroquois, writing dictionaries and catechisms in each (none of which have survived to today), as well as in her native French. Her most significant writings, however, were the 8,000-20,000 letters she wrote to various acquaintances. These letters constitute one of the sources for the history of the French colony from 1639 to 1671. Her collection of works discuss political, commercial, religious and interpersonal aspects of the colony and are helpful in the reconstruction and understanding of New France in the seventeenth century. Marie died of a liver illness on 30 April 1672.